Along with the cross-European chains, there is also an alarming rise in across-country chains, particularly when it comes to food. And nowhere is this trend more visible than when buying lunch in London. 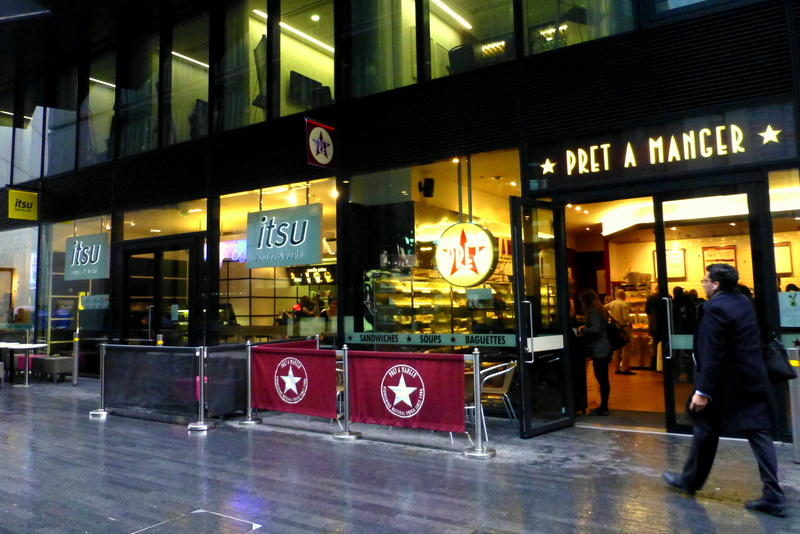 I have a lot of choice when I walk out of my office, as long as it’s a chain I’m after… Pret, Eat, Itsu, Pod. Actually, I don’t even have to walk out of my office … the café in the foyer is a Benugo! So my choice is this. I can have whatever I would like to eat, as long as it’s a pre-packaged version of whatever sandwich filling or sushi combination that some mysterious person in an office somewhere has decided that tens of thousands of people want to eat every day. So what is it I don’t like about these stores? What exactly is wrong with a quick and easy lunch like this? Aside from the oft-horrendous quality (or lack thereof) of the food itself and the nasty environmental impact of all the packaging and plastic cutlery these places churn through, my biggest gripe is the lack of choice available, the homogeneity of it all. How does that mysterious sandwich-designing man know what I want on my sandwich today? He doesn’t. I have to choose the best out of whatever limited selection he has decided I can choose from. In the Western world, it should be easier to have a wider choice of food available than it was 10 years ago. But when it comes to the lunch-time sandwich in London, it feels like we’ve taken a backwards step. What happened to the humble sandwich bar? You remember, the one where you actually got to choose which type of bread and which fillings you would like. Or… shock, horror… packing your own lunch? I think it’s a sad reflection on London society that the need for speed has become more important than the need for individual choice, not to mention quality. It seems that we have allowed sub-standard homogenous junk to take over our buying habits. Not cool peeps! So next time you head out robot-style to grab a sandwich from Pret, stop and have a little think about what you really want to eat. As important as you think your work is, in the big scheme of things it probably isn’t. Chances are it can wait the 5 extra minutes it will take you to go get something you really fancy for lunch. Reblogged this on Learning From Experiences.